Online herbal remedies advice from herbal remedies information to an herb dictionary online. Online herbal remedies advice can be very good information..or very awful and even at times dangerous. I will give you a good example. I saw a patient recently who has partial seizures. She had been well maintained on Depakote (valproic acid) with no breakthrough seizures for several years. She went to see her OB/GYN to ask about possible black cohosh side effects. Unfortunately, this provider did not think about herb/drug interactions and told her it should not be a problem...go ahead and take the black cohash for menopause. The patient began to have seizure like activity, and since I see her for seizures, came to see me. When she told me the story, I knew immediately what was causing the problem. Black cohash can lower the blood levels of depakote. The result is "breakthrough" seizures. She stopped the cohash and has been fine since. In her case, the treatment of seizures was more important than menopausal symptoms. There are a few sources I do recommend to patients. WebMD seems to be a great source for many medical problems. I personally use only one or two herbal books for reference. 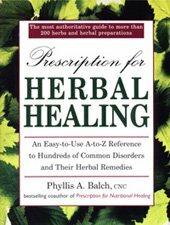 The one I like the best is Prescription for Herbal Healing: An Easy-to-Use A-Z Reference to Hundreds of Common Disorders and Their Herbal Remedies. Why do I like it? Because is it a comprehensive well written book which has each chapter reviewed by physicians. Nutritionists have contributed as have herbal experts. Over 200 medical conditions are discussed with recommendations as to which herb might be best for that condition. You can also click on the picture below to purchase this great herbal remedies source. This book has become my "go to source" when patients have questions and has been a great resource for this site when it comes to online herbal remedies advice.